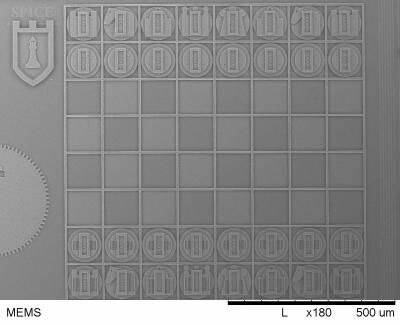 (Nanowerk News) The world's smallest chess board — about the diameter of four human hairs — and a pea-sized microbarbershop were winners in this year's design contest for, respectively, novel and educational microelectromechanical systems (MEMS), held at Sandia National Laboratories in mid May. The two winning teams will see their designs birthed in Sandia's microfabrication facility, one of the most advanced in the world. The micro chess board, created by students at Texas Tech, comes with micropieces scored with the design of traditional chess figures. Each piece is outfitted with even tinier stubs that allow a microrobotic arm to move them from square to square. Space along the side of the board is available to hold captured pieces. The microbarbershop, intended to service a single hair, employs a microgripper, cutter, moveable mirror and blow dryer designed by students at the University of Utah. "Our device is so small that a single misty drop of an Irish drizzle would swamp the scissors and drown the device," says team advisor Ian Harvey, a professor of mechanical engineering at the university. The high-spirited contest, open to institutional members of the Sandia-led MEMS University Alliance program, provides an arena for the nation's student engineers to hone their skills in designing and using microdevices. Such devices are used to probe biological cells, arrange and operate components of telecommunications and high-tech machinery and operate many home devices. The University of Utah's microbarbershop has all the components necessary to cut hair -- a single hair, that is. The contest helps develop a sense of the maximum and minimum displacement of a micro object, the amount of force needed to move it and the degrees of freedom needed for a part to accomplish its preset task. Texas Tech's chess board is 435 micrometers by 435 micrometers. (A human hair is about 100 micrometers in diameter.) Each chess piece is approximately 50 micrometers, or half the width of a human hair. The design integrates bidirectional linear drives that enable the movement of pieces longitudinally, a positioning stage with two degrees of freedom and, apparently, the world's smallest chess board. The teeny tiny chessboard designed by the Texas Tech team for Sandia's annual MEMS student design competition features chess pieces half the width of a human hair. 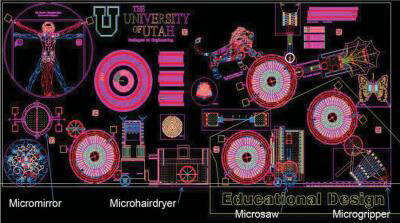 The University of Utah's microbarbershop consists of a microgripper that reaches off the chip to grasp a human hair and holds it in front of an off-chip deployed microbuzzsaw to be cut. Both microtools, driven by a ratcheting actuator, will be observed at a video-enabled station and portrayed on a large video monitor as they move and cut a human hair. Also included are a moveable micromirror, an off-chip micro hair dryer and an off-chip single-hair "teaser" to complete the playful notion of a barbershop and convey an intuitive sense of relative scale for these tiny machines. Contributing to Texas Tech's success were Sahil Oak, Sandesh Rawool, Ganapathy Sivakumar and Ashwin Vijayasai, says team advisor and electrical engineering professor Tim Dallas. Leading the Utah effort were Austin Welborn, Brian Baker, Kurtis Ford, Alex Hogan, Ted Kempe, Keng-Min Lin, Charles Fisher and advisor Ian Harvey. This year's contest participants included the Air Force Institute of Technology, the universities of Oklahoma and New Mexico and the Central New Mexico Community College. The MEMS University Alliance is part of Sandia's outreach to universities to improve engineering education. It is open to any US institution of higher learning. The alliance provides classroom teaching materials and licenses for Sandia's special SUMMiT V™ design tools at a reasonable cost. This makes it possible for a university without its own fabrication facilities to develop a curriculum in MEMS. The design competition is an increasing activity within the University Alliance, which now has more than 20 members. The entire process takes almost nine months. It starts with students developing ideas for a device, followed by creation of an accurate computer model of a design that might work, analysis of the design and, finally, design submission. Sandia's MEMS experts and university professors review the design and determine the winners. Sandia's state-of-the-art MESA fabrication facility then creates parts for each of the entrants. The SUMMiT V™ fabrication process makes MEMS devices with five levels of polysilicon, the most of any standard process, and is especially well-suited for making complex mechanisms such as gear drive trains. The design competition capitalizes on Sandia's confidence in achieving first-pass fabrication success, which restricts the entire process to a reasonable student timeframe. Fabricated parts are shipped back to the university students for lengthy tests to determine whether the final product matches the purpose of the original computer simulation. The University Alliance coordinates with the Sandia-led National Institute for Nano Engineering (NINE), providing additional opportunities for students to self-direct their engineering education, and the Sandia/Los Alamos Center for Integrated Nanotechnologies (CINT), a DOE Office of Science center with the most up-to-date nanotechnology tools.